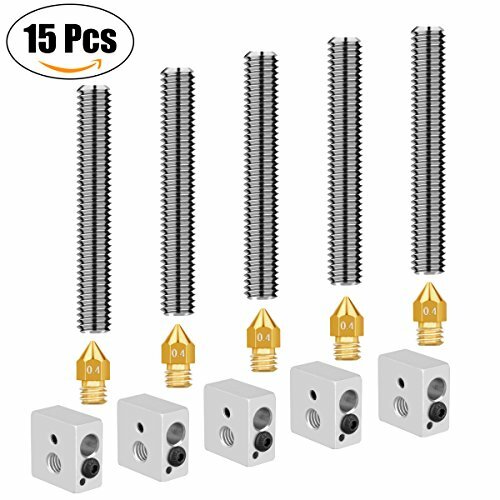 【Components】- those 3d printer parts including 5pcs 0.4mm extruder nozzle + 5pcs aluminum heater block + 5pcs teflon throat tube 1.75mm. 【0.4mm Extruder Nozzle】- Color - Golden; Material - copper (brass); Size - 5*13mm; Input Diameter-1.75mm; Output Diameter-0.4mm. 【Nozzle Throat Tube】- Material - Stainless Steel; Outer Thread - M6; Inner Diameter - 2mm; Length - 30mm; Filament Diameter - 1.75mm. 【Heater Block】- Color- Silver; Material- aluminum; Size- 20*20*10mm; Inner hole for set screw- M3/M6; Inner hole for heating tube- 6mm; Inner hole for thermocouple- 3.3mm. 【Compatibility】- Working well with 3d printers such as Mk8 Makerbot/ Anet A8 Reprap Prusa i3. If you have any questions about this product by JANSANE, contact us by completing and submitting the form below. If you are looking for a specif part number, please include it with your message. [Gulfcoast Robotics] 1.75mm Filament All Metal Bowden Extruder Upgrade for RepRap 3D printer Prusa i3 or Mini Kossel.